A Conservative party report has concluded that the backbench MP Aidan Burley acted in a “stupid and offensive way" when he hired a Nazi uniform for the groom during a stag party in December 2011. A Nazi themed toast was also given. However Lord Gold, the Conservative peer who authored the report absolved Burley of racism or anti-semitism. What is it with the British establishment and their penchant for Nazi uniforms? One might have thought that the Prince Harry debacle a few years back may have forced a rethink on such behaviour, but Burley was clearly not to be deterred. He had been pegged as a ‘high flyer’ by the Tory leadership who marked him out for advancement after his election in 2010, and he had been promoted to the position of ministerial aide – a post he lost when the scandal broke. 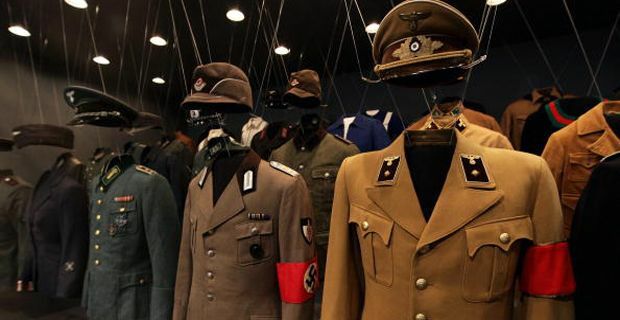 He had initially been given the benefit of the doubt, until a Mail on Sunday investigation revealed that Burley had personally hired the SS uniform. The groom, 33 year old Mark Fournier who Burley had attended Oxford with was yesterday fined €1,500 (£1,230) by a French court for "wearing a uniform or insignia of an organisation guilty of crime against humanity". The court failed to find the ‘joke’ remotely funny. The court also ordered Fournier to pay €1,000 in damages to an organisation representing families of those who were deported to Nazi concentration camps. "The report concludes that Mr Burley's conduct caused deep offence and that he acted in an unacceptable and offensive way … Mr Burley is not a bad man, still less a racist or anti-Semite. However, his actions were stupid and offensive, and the conclusions and recommendations reflect that." "Aidan is a hard-working MP who is committed to his constituents in Cannock Chase and I do not believe Aidan is at all anti-Semitic. He has paid a heavy price for his foolish behaviour over two years ago and has rightly apologised repeatedly for his error of judgment. I am confident he will be an effective representative for the people of Cannock Chase and he has a lot to offer in public life." Austin said last night: "He claimed at the time that this event was a fancy dress party, and he told his constituents and the Jewish Chronicle that he had not known what was going to happen. The trial in France and this report shows neither of those statements was true and it beggars belief that anyone should believe him now. His behaviour was an absolute disgrace and I can't understand why the Tories haven't removed the whip." "Why is the Tory party so determined to stand by someone who has admitted to bringing disgrace on his constituency and who many people feel is not fit to be an MP?"